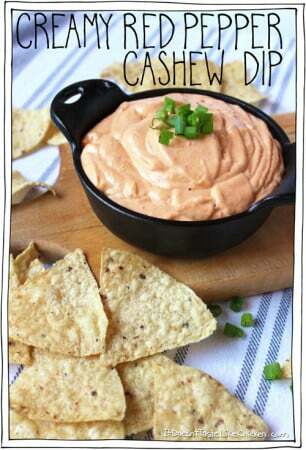 Creamy Red Pepper Cashew Dip. A healthy, vegan, dairy free, whole, oil free, gluten free, raw AND takes only 10 minutes to make! Darn tasty, creamy, almost cheesy, nacho-like, yum. Add the raw cashews, 1/2 cup non-dairy milk, the red pepper, nutritional yeast, garlic, lemon juice, chili powder, and salt to a blender. Combine until smooth, stopping to scrape the sides as needed, and adding up to 1/2 cup more non-dairy milk as needed to reach desired consistency. To boil the cashews, add the cashews to a pot and cover with water, bring to a boil and cook for about 10 minutes until cashews are tender. Drain and rinse. To soak the cashews, put the cashews in a bowl and cover with cold water, soak for 4 hours or overnight until tender. Drain.